Painful swollen joints in fingers are often the result of broken bones or torn and stretched muscles, tendons and ligaments. If you have swollen finger joints with no discernable cause, they could be signs of a serious medical condition. Left untreated, swelling can lead to crippling joint deformity. Swelling occurs when there is an increase of fluid in the tissues surrounding joints. Osteoarthritis and rheumatoid arthritis (RA) are two of several causes of joint swelling and often attack the joints in the fingers. Both of these types of arthritis will cause pain and can lead to further complications if left untreated. Osteoarthritis occurs from normal wear and tear on joints as they age. With osteoarthritis, the cartilage between the bones wears down, causing bones to rub against each other. This results in pain and swelling. Osteoarthritis often attacks the finger joints. You have swelling of the large finger knuckles in both hands. The swelling typically feels tender and soft. The pain associated with the swelling in your large knuckle joints has lasted for more than six weeks. There is swelling of the balls of your feet, especially early in the morning. You experience flu-like symptoms and bumps on your elbows. Your morning stiffness lasts for more than an hour. Blood test results can be used to diagnose RA. If you suspect you are experiencing RA symptoms, speak with a medical professional about taking a blood sample. If your swollen finger joints have begun to affect your daily life, you need to see a healthcare professional who can diagnose the problem and recommend treatment. Early detection and treatment of rheumatoid arthritis can help to prevent serious permanent joint damage. At FastMed Urgent Care, our compassionate medical professionals can examine your swollen finger joints and may decide to perform tests to determine the cause of your pain and swelling. Our state-of-the-art facilities are equipped with digital X-ray machines and on-site labs, so that we can find answers and get you on your way fast. 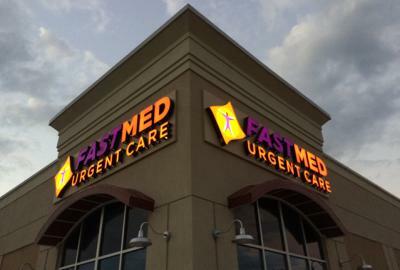 FastMed is often faster and less costly than the emergency room, and you don’t need an appointment in order to visit! See why our patients love us and stop by to find out more for yourself.